So when they have finally got used to certain foods, as they get older they can get more adventurous with small versions of adult food. This is where is all gets exciting as then you can all sit down together and have dinner as a family. 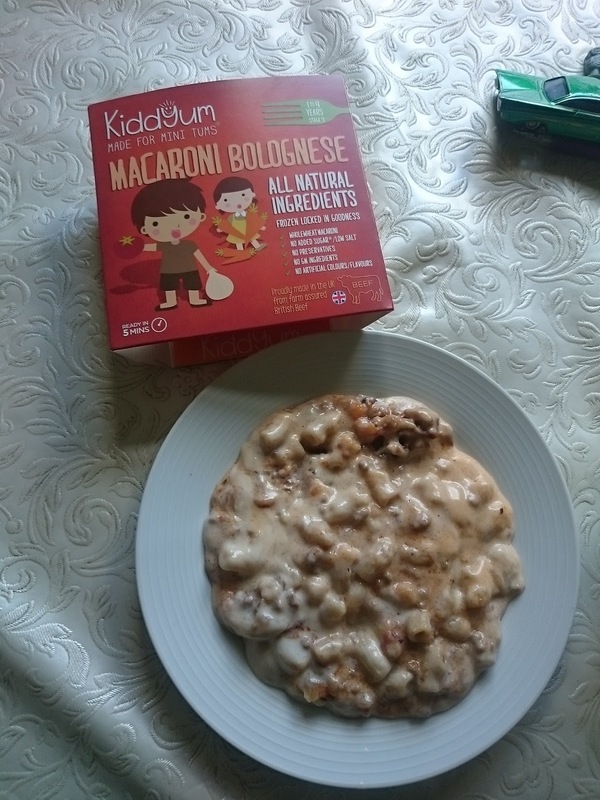 I was contacted by Kiddyum to see if we would like to try their easy meals for kids. I have a four year old who really likes his food, and he enjoys a variety of flavours. However, I generally cook fresh foods, but when I am in a rush because of after school clubs, dinner can be a simple pasta dish. So with having a few frozen meals in the freezer can be a blessing when time is limited. Kiddyum have 5 different flavours at present. Kiddyum is actually a home based business that became so popular that Sainsbury's had to stock it because it heard how great they are. Each dish is designed by a mum for her kids and now we are all benefiting from her skills. Thank you Jayne !! They have great packaging, and I love the design. The characters are all very cute and fun, so the kids can choose their own dinner too. These are currently sold in the frozen section in Sainsbury's, so they are easy to find because of the bright colours. The reason they are frozen is to keep them as fresh as possible. They must remain frozen to keep locked all the natural goodness in them. Each dish is 200 grams and they are very healthy and suitable for young children. the pasta dishes use *Wholewheat macaroni pieces. My kids chose all the dishes apart from the Cottage Pie. So, let me show you what you can expect. You can microwave for 3-4 minutes or oven bake for 30-35 minutes. Each dish I am going to show has been cooked in the microwave. As you can see from the ingredients in the Macaroni Bolognese, its all good stuff, most of which you would use at home cooking yourself. No nasties added at all. As you can see, its not presented beautifully, however, it actually tasted pretty good. Considering this is for a child, I think any adult would eat it too - with a sprinkling of salt though. It had that Children's taste to it, (no added salt) and my 4 year old actually thought this was fine and ate quite a bit of it. It had loads of pasta pieces and a good amount of meat. As it was microwaved, there was no crispy topping, so its quite a sloppy dish, but for a child...that is still learning textures this is the perfect consistency. I actually liked the fish pie. It smelt like a fish pie and tasted like one. I could have eaten this, with some added seasoning with no problems. Its very fine and had extra hidden vegetables. It is pollock and salmon with carrots, sweetcorn, leek and spinach with mash potato. No complaints here by me, however my son doesn't like sweetcorn (or doesn't EAT) so he decided that he wasn't going to eat this one. I love that the fish is all sustainably sourced from the UK. On the whole, we were impressed. I think the age is pretty much right, however....I think between the ages of 3 and 4 children can be more adventurous with their foods. So if Kiddyum could produce maybe a BBQ flavour and a Chinese flavour with Noodles that would be great, and would satisfy the older group...and possibly the younger group too. All the dishes are made in the UK and use as many UK produce as possible. They are £2.20 each dish in Sainsbury's. I would definitely recommend these for those moments where you just can't cook yourself because of time limits or you fancy something really spicy. So they can have something special just for them. 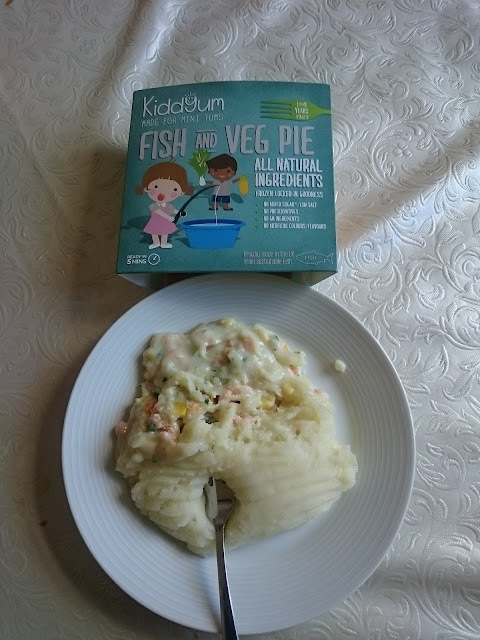 Have a look at their website for the ingredients lists and other details www.kiddyum.co.uk and get to Sainsbury's to stock up your freezers.